Triathletes are heading into the off-season. It’s harder and harder to convince myself to do an open water swim even with the full wetsuit. Bike rides are less intense, but running is staying constant due to our Rachel x Two Seattle Half Marathon training group, which is now in week three and will be doing increasingly longer runs through November. No one is longing more for the off-season than my pal and co-coach Rachel Scheiner who is doing the Ironman World Championships in Kona tomorrow. She trained all year for Ironman Canada in late August, and voi-lá, did so well (11hrs and a few minutes) that she ended up with one more big race on her 2011 calendar. She said, “it’s not going to be a competition, it’s going to be an experience. This girl does not tire easily, but man is she pooped. The prodigious fleet footed Martinez kids got podium spots for their cross-country runs at the CYO meet last weekend. Their mom Molly and aunt Karen O’Connor are tapering for the Leavenworth Half Marathon next weekend. Cece Briggs did spirited loops of Seward Park and reports that people don’t like being passed by a pregnant lady. 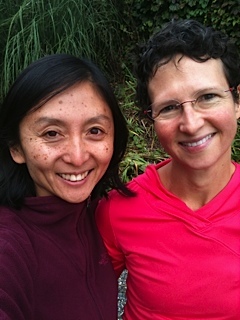 Rose Yu showed me her favorite walk/run/photography routes in Madison Park.